David Lummis, CEO of The British Safety Industry Federation introduces the Registered Safety Supplier Scheme and discusses the ongoing issue of fake hand protection. Buying a fake watch may be illegal but it is unlikely to be life threatening. Supplying fake personal protective equipment (PPE), however, could be the difference between life and death. The British Safety Industry Federation (BSIF) is calling upon individuals working in the health and safety profession to ensure that quality CE approved PPE is used, thereby protecting lives. Unfortunately, fake and illegal products being manufactured and sold within the PPE industry are an increasingly common problem. Over recent years, a plethora of items have entered the marketplace, from gloves to high visibility vests, which have been produced using sub standard materials. Often these products are finished such that, to the untrained eye, it is difficult, if not impossible, to identify that they are fake. 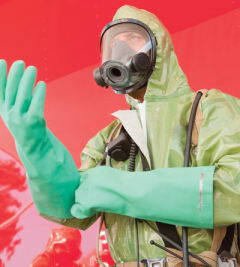 Due to the purpose of the equipment, PPE needs to meet stringent performance standards. Quality, CE approved PPE meets and often exceeds these performance requirements and hence will protect individuals from hazards faced in the workplace. The use of fake and illegal products could prove fatal. Obviously the size of this problem is something that cannot be eradicated overnight, but measures have been put in place to help combat the counterfeit PPE trend. Ongoing communication between manufacturers and end users is paramount. As a membership organisation, the BSIF takes a heavy interest in monitoring the marketplace to help contribute to the curbing of this unprincipled behaviour that is unfortunately?ongoing. The BSIF liaises very closely with its members, including test houses, to look out for and react to fake and illegal PPE. The Federation also works closely with Trading Standards and Local Government Regulation, the national coordinating body, the Health and Safety Executive (HSE), the European Safety Federation (ESF) and the Government Department for Business, Innovation and Skills (BIS) that has the responsibility to ensure products are appropriately CE marked. A recent example of such an investigation was when it was brought to the attention of the BSIF that prescription safety glasses were being sold as CE approved safety equipment, when in fact certification had not yet been granted. The BSIF became involved in this enquiry which led to the product being withdrawn from the marketplace until it had gained the required certification and the supplier/manufacturer was asked to write letters to its purchasers to apologise. The actions carried out by this organisation were illegal; the people using the non-conforming safety glasses were therefore being subjected to unnecessary risk. Through one BSIF member ‘raising the alarm’, however, the Federation was able to help ensure that the situation was rectified with the much needed preventative measures put into place. Additionally, in March 2011 an importer of ‘low value’ safety helmets was taken to court by Trading Standards for supplying non-conforming products, plus a major fall arrest harness manufacturer indicated that there may be supplies of counterfeit products from its range available in the European market. The above situations are clear examples of the BSIF’s commitment to protect workers and ensure only compliant products are supplied within the UK. The BSIF has made further progress to ensure compliant safety equipment is supplied to end users in the form of its Registered Safety Supplier Scheme that helps signpost purchasers of safety equipment to safety experienced and ethical companies who will work tirelessly to provide safety equipment that ‘does what it says on the tin’. The BSIF introduced the Registered Safety Supplier Scheme in 2009, which allows members to identify themselves as having made a formal declaration that they are selling only products which are genuine and legal. This declaration is, as a condition of the scheme, audited through special provisions set out within the company’s ISO9001 Certification. Under the Registered Safety Supplier Scheme this independent audit is one of the key requirements to independently verify conformance: it is the BSIF’s belief that the independent audit is a key part of the robustness of the scheme. The BSIF actively promotes this scheme to its members and encourages end users to look for the shield to guarantee compliance, performance and quality. The Registered Safety Supplier Scheme acts as a vanguard for people to ensure that they can buy from a reputable company whom they can trust to supply genuine legal products and provide good advice. How easy is it to spot counterfeit or illegal PPE? Did you know that one of the basic health and safety requirements is that all PPE must be supplied with instructions for use? Did you know that it is a legal requirement for PPE products to not only carry the CE mark but for the mark itself to be ≥5mm? In reality, even for PPE experts, it can be difficult without destructive testing to identify whether or not a product is compliant and meets required performance standards. When put side by side, a conforming product and a non conforming product look virtually identical; however, it is possible to confirm the quality of the product through obtaining the certification. To assist specifiers and users of PPE to spot a potentially non-compliant product, experts from within the BSIF membership have created the following easy to use checklist: If you answer ‘No’ to one or more of the questions above then you should immediately contact your PPE supplier for advice. As a minimum, the supplier of the product should be able to provide you with an EC Declaration of Conformity or EC-Type Examination Certificate for the specific product in question. As with many providers of personal protective equipment, manufacturers of hand protection have seen an increase in the number of counterfeit and illegal products available on the marketplace. Hand protection is a vital form of PPE in a number of different industries, including waste and recycling, construction and manufacturing, where workers have to work in extreme temperatures and handle dangerous and toxic substances. If the hand protection is made from sub standard materials and fails, then the wearers risk serious injury that could stop them from working and even carrying out basic day to day tasks. For many, protecting our hands may not be top of the list of priorities; however, statistics from the HSE show that although hand injuries are not usually fatal, they can seriously affect a sufferer’s way of life and ability to work. In 2009/10, 108 workers suffered from cuts to their hands from sharp/coarse material or machinery, or as a result of trapped fingers. In the same period, the HSE estimated that 22,000 people suffered ‘skin problems’ caused or made worse by work, with 1,735 of these diagnosed with contact dermatitis. David Lummis said: “With so many varieties of high performing, CE approved hand protection available on the marketplace, the number of hand and arm injuries still taking place is concerning. Glove manufacturers are trying to help make the selection process easier by launching best practice initiatives and conducting hand protection assessment surveys. • Consider the task - Gloves should protect, not hinder the user: choose gloves that balance protection with dexterity and ensure the gloves selected meet the standards required for the task. David Lummis said: “Certified goods will always be paramount in the health and safety world and being extra vigilant when looking after your workforce is essential when health and lives are at risk. “Just being aware of the type of counterfeit items available on the marketplace and remembering that offers that seem ‘too good to be true’ usually are, is a step in the right direction.